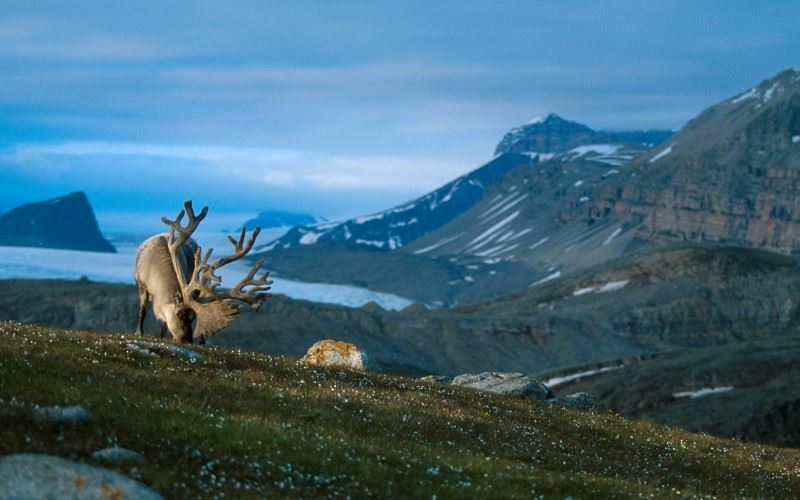 The landscape of Svalbard transforms before your eyes as autumn sets in. The days become shorter and glorious golden hues take hold of the mountains, you may even see the first dustings of snow. We love this time of year. It offers all of the experiences of the summer plus the cosiness of the fall. You may even be blessed with displays of the Aurora Borealis from the skies above. On arrival at Longyearbyen airport, self transfer to Funken Lodge using the airport bus service. This evening, you will be transferred 10km outside of the capital to Camp Barentz in the Advent Valley for a relaxed evening amidst a pristine natural backdrop. Reindeers and Arctic foxes are often observed in the close surroundings and, away from the city, you can enjoy a 360° panorama of the mountains and dusky sky. A local dinner is served around a roaring fire and a presentation on polar bears and local folklore is provided. Overnight at the Funken Lodge in Longyearbyen. Longyearbyen was settled by the mining industry and for many years this, alongside Arctic expeditions and scientific research, was the life-blood of the archipelago. In 2017, after 100 years of Norwegian coal mining in Longyearbyen, the last commercial mine closed (mine number 7 remains open providing power for the local community). On this 3 hour excursion you will explore ‘mine number 3’ and will learn about coal production and the life of the miners on Svalbard. It is dark, cool and quiet in the mine; if you listen carefully you can hear the mountain talking to you. Your afternoon is at leisure in Longyearbyen. Why not visit the Svalbard Museum, the local handicraft centre and the art hall? This evening we have included two experiences for you. The first is beer tasting at the Svalbard brewery, which at 78° north is the world’s northernmost beer producer, made from 2000 year old glacial water. The second is an evening meal at Funken Lodge, an experience far-removed from your wilderness meal on Day One. Svalbard is alluring in part because of its sheer remoteness. Wherever you are your group and your guide are likely to be the only humans there. In Europe, this being alone is an all too rare experience. Today, alongside your local guide, you will hike to the summit of the Troll Stone Mountain (strenuous) from where a far-reaching view over Longyearbyen, the Isfjord and the mountains beyond unfolds. Take the opportunity to enjoy the silence and calm of this intoxicatingly beautiful scene. For your final night in Longyearbyen we have reserved a table at Huset. The restaurant has received a ‘Wine Glass’ from Wine Spectator and offers fine dining of a Michelin star standard, without the price tag. After breakfast, self transfer to Longyearyen airport using the airport bus service for your return flight to the UK.